I got a call this morning that my brother is doing fine and would be home later in the day, so my services will not be needed taking care of the invalid crew after all. I’ll have to go and see them some other time. Later in the day, my brother called me himself to let me know he was home, exhausted from all the tests and being poked with needles and such, and on Percoset for the pain. He sounded well, but really really tired, so I’m happy and only a little worried now. I’ll probably hear from him again sometime tomorrow. I know I’ll be home for Yule, but maybe not for the rest of the week. I just heard my brother was admitted to the hospital last night. Add to that my mother just got out of surgery and there may be no one to look after things in his household. If things are bad for him and he’s stuck in the hospital for the holiday weekend or longer, it looks like I’ll need to head down to take care of my mother, my niece, and maybe my brother until he’s better. Can’t say no when family needs help, and we’ll see how things stand tomorrow. I hope things are alright. Today we bought Morgan a stopwatch. He’s been asking for it for a couple of days now. 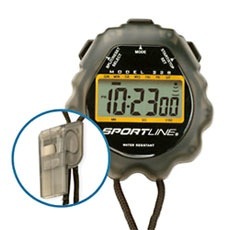 We weren’t sure why he wanted it, but when he’s specific about things he wants we try to accommodate him, so on our weekly grocery run to Wal Mart we found a nice ten dollar electronic stopwatch, a Sportline 228. We got him home and made him wait while we put the groceries away, finally getting out his stopwatch and reading the instructions (there weren’t many) to get it working. I set the date and time, and then showed him how to turn on the timer and how to stop it. He immediately pointed it at me and hit the time button, looking at me expectantly… and looking… and looking. He got really upset and we were trying to figure it out, when it hit me. He expected the stopwatch to actually stop time, and he was upset because I didn’t freeze in place when he pointed it at me and hit the button. This got an Oh… My… God… out of Ash, and then started laughing at the absurdity of the entire situation. I played with Morgan for a bit, freezing in place when he pointed it at me and letting him then move my arms and such around, still staying frozen in whatever pose he picked out for me, then acting as if I didn’t know what had happened when he turned time back on for me. He was very happy when it was working, but a little disappointed when he found out it didn’t work at all on Mommies or cats, and only occasionally on Daddies. So now, he’s been complaining to Ash. This is shaping up to be a long spring break. Now with 20% less Geek! Just took a poll at Ash’s blog. Once again she is more awesome than me. We got the phone call over dinner that Tiberius is dead. He was doing alright earlier in the afternoon, but died in between their visits. I felt a warm gentle fire once. Gave me a capacity I didn’t know of. feeling ahead over any gap. Not quite seeing what was in front of you. How much we loved you, doing your silly little things. about a far land where you were once happy. with no one you know around you. My heart breaks for my little one. That irrational math that fills a space even as you pour it out and empty it. Please, little one. Please don’t leave. Please come and sit on my lap again. Purr and make me warm and calm. I did when you were here before. Hopes dashed. I went to the vet to pick up Tiberius and she brought me in to an exam room to talk about his case. Last night and into today he’s been developing something called FIP. It stands for Feline Infectious Peritonitis, and turns out it is even deadlier than Feline Distemper. He’s going to stay in the hospital over the weekend, and we’ll have the results of blood tests. But, he may not survive until Monday. I was forlorn when I heard this. I went home quickly to give Anne some time to visit. They close at noon today because of the New Year holiday. I stayed home and tried to keep my mind on other things. I finally broke down and cried when Anne got home. I was so distraught. They will give us daily calls on this status. Anne said he was doing worst now. She gave him one chance in a hundred. We’re now not even sure he’ll make it until Monday. I went back to work but I’m not really able to do anything constructive. I don’t know what to write about now, either. For now we wait and hope some more. I guess it wouldn’t be the holidays without an emergency visit to the vet. Tiberius is pretty sick and rather than wait until Monday, I had to take him in to the emergency clinic today. … Just saw the vet and it’s bad. Tiberius is dying and we have to see how bad he is and whether he has any chance. I’m not going to just abandon him, even though the vet things it’s a hopeless case and we should euthanize him now. They’re going to do some lab tests and then we’ll see where we are. … Lab tests confirm he has Feline Distemper. We’re going to give him treatment. That means supporting him while he fights off the virus and trying to make sure he doesn’t get something else, because that is what usually kills cats with Distemper, the secondary diseases they can get when their immune system is knocked out. I wasn’t happy with the attitude of the vets. It seemed like they were just going to give up on him, and were hinting that he needed to be put down even before they ran bloodwork. The technicians were much more compassionate. But i suppose that’s the usual way of things. Nurses are usually more empathetic than doctors, in my experience.